A leaking basement is a common problem in all types of basements. From poured concrete foundations to monolithic, stone, block or tile basement walls, no basement is safe from water leaking through the basement walls, floor, and floor joist and then entering into your home. Why basements leak in MA? After fixing thousands upon thousands of basement leaks in Massachusetts at Leader Basement Systems have seen it all, and we appreciate just how damaging a basement water problem can be to your home, health and personal possessions. A home is one of the greatest investments that an individual can make, and allowing an entire floors worth of space to become flooded will ruin the value of your home. Dry Basements can be used as storage space or finished to make a warm, beautiful, new living space in your home. There are some old & new basic approaches to fixing a leaky basement. The old basement repair solutions cause additional problems. Sealing Basement only works for a short time. Exterior Waterproofing clogging will persist. French Drain is unsightly & will clog. While all of these solutions work at least some of the time, you need a solution that is going to work ALL of the time. This means finding a system that is never going to clog, become overwhelmed or need extremely expensive maintenance. 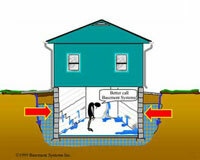 Our cost-effective basement waterproofing solutions provide a permanent way to fix your leaking basement problem in MA. All of our patented wet basement repair products are exclusively provided by Leader Basement Systems in the state of MA and CT.
A basement repair option provided by Leader Basement Systems for monolithic foundations and is one of the most effective and least invasive methods for fixing basement leak problems in Western and Central MA. A basement repair piping system engineered specifically for leaky basements and designed to avoid the basement repair problems of other approaches available in Massachusetts by Leader Basement Systems.